See the real-time, 3D visualizations of biological cells and tissues. 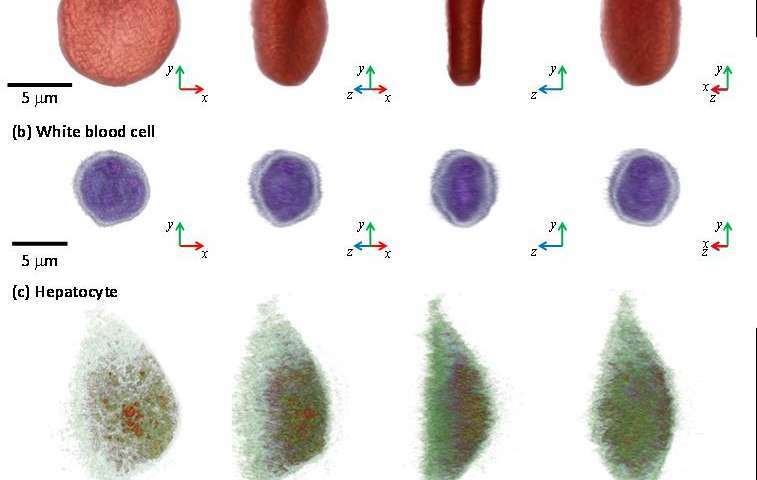 Professor YongKeun Park of the Physics Department at the Korea Advanced Institute of Science and Technology (KAIST) and his research team have developed a powerful method for the 3D imaging of live cells without staining. The state-of-the-art, 2D/3D/4D holographic microscope will allow a real-time, label-free visualization of biological cells and tissues. The new microscopic tool is called the holotomography (HT)-1. It was announced to the global marketplace through a Korean start-up that Professor Park co-founded called TomoCube. From the measurement of multiple 2D holograms of a cell, coupled with various angles of laser illuminations, the 3D refractive index (RI) distribution of the cell can be reconstructed. This 3D map provides structural and chemical information, such as dry mass and protein concentration. “As one of the two currently available, high-resolution tomographic microscopes in the world, I believe that the HT-1 is the best in class regarding specifications and functionality. Users can see 3D/4D live images of cells, without fixing, coating or staining cells. Sample preparation times are reduced from a few days or hours to just a few minutes,” said Professor Park. Two Korean hospitals, Seoul National University Hospital in Bundang and Boramae Hospital in Seoul, are using this microscope currently.